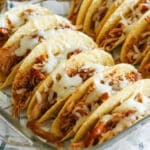 Crisp pulled pork, sweet and spicy barbecue sauce, and plenty of cheese are stuffed into crunchy taco shells to make some of the best tacos I’ve ever tasted! Taco shells are beyond handy to have in the pantry for quick and easy dinners. You can stuff them with almost anything and have an easy dinner in a crunchy “wrap” in minutes. Just about any leftover works when it’s held in a crispy taco. And yes, my kids have tried stuffing taco shells with almost everything. I’m partnering with Safeway and Old El Paso today to tell you about our favorite new tacos. Pulled pork is my go-to main dish for so many reasons: it can be made in the crockpot, it easily feeds a crowd, it makes spectacular leftovers, it can be used in countless ways! 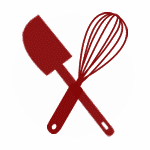 Pulled Pork Sandwiches, Barbecue Sundaes, Filthy Burgers, Pulled Pork Enchiladas, Pulled Pork Taquitos, tossed with taco salad, served with potatoes or rice. I started piling leftover pulled pork on our nachos a while back and my kids frequently request Pulled Pork Nachos for lunch when we have pulled pork in the fridge. The other day, when I was starting to make lunch, my eye fell on the boxes of taco shells in the pantry. I couldn’t resist trying out an idea for pulled pork tacos. And let me tell you, Pulled Pork Tacos are a great idea. Preheat the oven to 400°F. 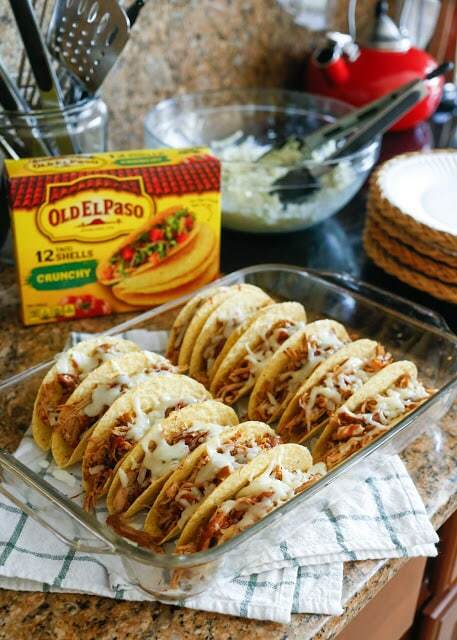 Arrange the tacos in a 9x13 baking pan. 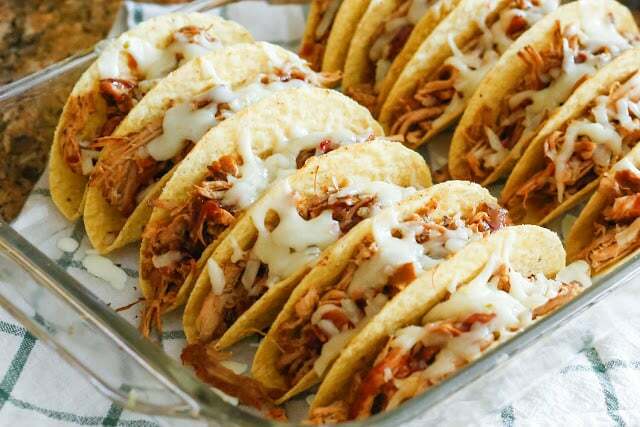 Scoop the pulled pork into each taco shell. Drizzle lightly with barbecue sauce. Sprinkle generously with cheese. Bake until the cheese has melted, about 8-10 minutes. Top with coleslaw or serve on the side. Enjoy! If you're in a rush, feel free to pick up already cooked pulled pork at the grocery store. You can find it in the deli section in most grocery stores. Store-bought barbecue sauce will work fine as well. 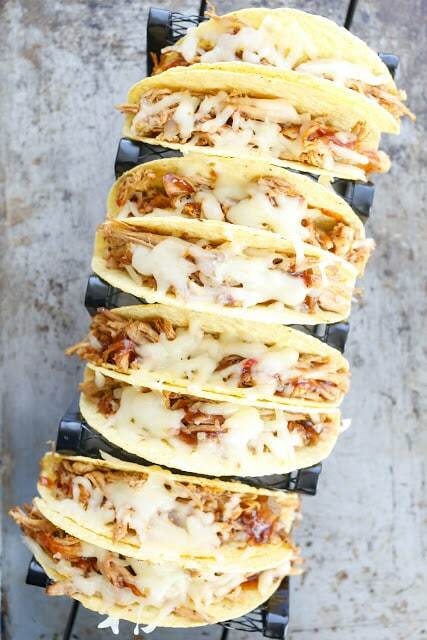 I've linked below to my favorite recipes for making these tacos from scratch. Don’t forget to clip your Box Tops and save them for your Box Tops For Education registered school. Each Box Top is worth 10 cents to redeeming school. Limit $20,000 per school, per school year for Box Tops redeemed through the Clip Program. See www.boxtops4education.com for program details. Disclosure: I’ve partnered with Albertsons & Safeway to share this recipe with you. Thank you for supporting the brands that make Barefeet In The Kitchen possible. As always, all thoughts are my own. Great looking tacos Mary. As a BBQer, I try to always have some pulled pork in the freezer for meals like this. This sounds so good, thanks for sharing this delicious looking recipe.